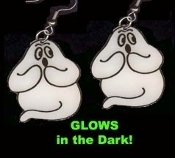 HUGE Funky GLOW GHOST EARRINGS - Halloween Haunted House Trick-or-Treat Novelty Charm Costume Jewelry - GID - Glow-in-the-Dark Plastic Charms, each approx. 1.5-inch (3.75cm) Tall. *Needs no batteries, never wears out. Charges in Bright Light!